In 28 days, 2017 will be over. As it stands, gold sits at $1,280.80. So far, it’s up 11%, only 5% shy of the 52-week high that was reached during the North Korean crisis in September. Stock markets are soaring, inflation is low, unemployment is low in the U.S., even Europe is showing signs of life, and cryptocurrencies are posting gains that we’ve never witnessed in our lifetimes, yet gold’s demand is high. As investors realize that alternatives to fiat currencies exist and should be added to their portfolios, they still have many barriers of entry into cryptocurrencies. On December 18th, though, with the launch of the CME Group’s futures exchange, you’ll see many new players in the Bitcoin market – both good and bad. One thing is certain: Bitcoin’s rise, along with the other dominating cryptocurrencies whose focus is on value transfer (Dash, Monero, and Litecoin), have brought to the surface the fact that when it comes to a physical currency, nothing is better than gold and silver. In other words, cryptocurrencies prove that digital currencies have valuable attributes, such as speed of transfer, instant global reach, low fees, privacy, and many other positive characteristics, but they also shed a positive light on gold’s unique traits, mainly that it is an element in nature – a physical and tangible asset. Cryptocurrencies have made investors more aware of gold than at any other time in the past 46 years, with the exception of the ‘79-‘80 market top phase and maybe 2011’s market top as inflation fears mounted. 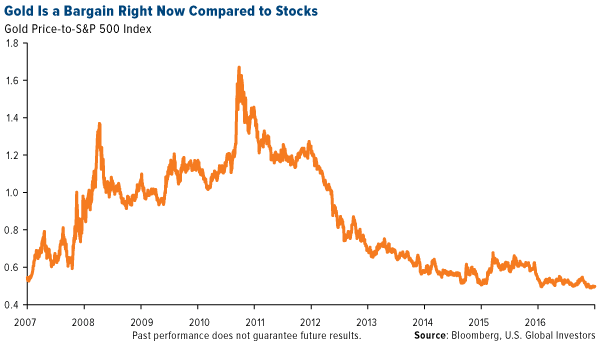 Here’s the thing, though: gold stocks continue to be an ongoing nightmare, no matter how capable the management is. I’ll tell you why so that you can decide for yourself how to strategize your next steps, and I’ll share with you what I personally do. The S&P 500 hasn’t fallen more than 3% from a previous high for more than 388 days – its longest streak ever. As you can see, some of these reasons are constant, while others fluctuate with the economic tides. Because inflation is low and has been for a number of years, investors want real returns and choose stocks and real estate over gold (reason No. 1). Since both of these are rising in price every single year, the need for diversification is small (reason No. 2). Central banks have given investors the impression that their policies have succeeded and that the credit threat of 2008 has disappeared from the map (reason No. 3). Cryptocurrencies have given investors another asset class with non-existent counterparty risk (with outlawing being the only threat), thereby forming a digital competitor to the role of gold as a limited source of money that can’t be created by deciding to issue new units like banks do (reason No. 4). 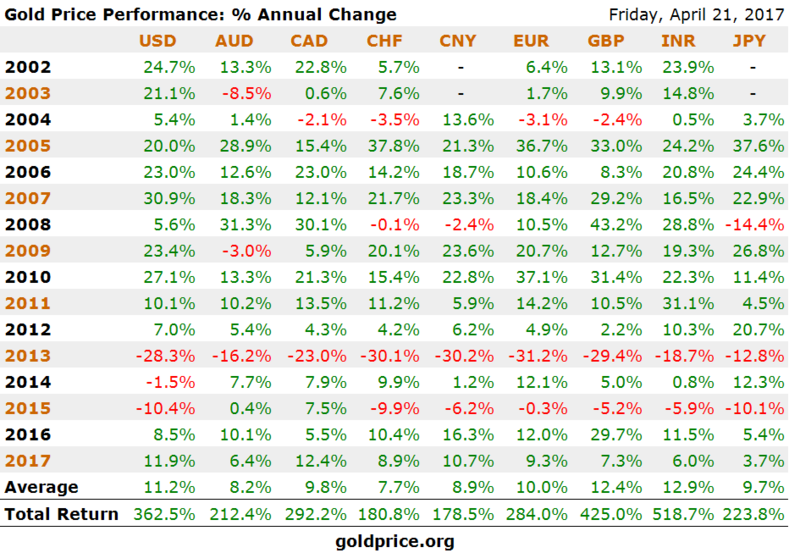 Gold is under pressure from all sides, as most don’t see a reason to own it. The mining companies, from operating miners to development-stage, exploration-stage, and the specialty models (optionality and prospect generators) have all suffered more than gold itself. Since they’re a speculative, leveraged form of investment, they are much riskier than physical gold. In fact, they’re one of the riskiest asset classes around. This is because downturns can send them 70%, 80%, or 90% down and terminate many of them by way of bankruptcy. On the flip side, because they represent such a small investment niche, when fund managers want exposure to them, the moves are unrivaled. Right now, valuations are horrific and cheap. Most companies are slowly bleeding. The main problem they’re facing as a group is their inability to cut costs and discover gold. If you go back to the 4 reasons to own gold, you’ll see that reason No. 1 and No. 2 are now coming into play. Growth is returning to the global economy, and as spending for housing and infrastructure increases, inflation will rise (probably to 4%-5%, officially). Stocks will peak somewhere in the 8- to 14-month range, which will increase the need for diversification. For reasons No. 3 and No. 4, Wealth Research Group sees political issues as a major threat in the coming years, as China will look to establish dominance over the West. Volatility will become a part of the game. In that type of world, central bankers are prone to making more mistakes – the type that caused 2008 to occur. The bottom line is this: because peak gold will hit in 2019, fund managers will be eyeing companies with proven, economic, and near-term projects. They’ll also want to own the miners, but only those with fat pockets who will make acquisitions to replace depleting mines. The fundamentals are there, but the incentive to move capital from the S&P 500 (which is breaking records) to the gold sector, which is not hot right now, is low. Fund managers can’t beat the returns of individual investors who have patience, though – they never have and never will. That’s because early investors, like my partners and I have been, and like Rick Rule has been throughout his career, are willing to “sit” on losing positions and red screens for years as long as we know the management team is fighting tooth and nail to advance the underlying business. We accumulate more shares every month, thus lowering our average cost of entry at the same time we’re shorting the entire sector. The idea is to make money exploiting the weakness of the sector as a whole, while getting to build an even larger and cheaper position with the people we trust. When the market flips directions in 2 months, 3 months, 9 months, 12 months, or 18 months, for all we care, my position will be the size I want and I’ll be selling to fund managers, but you and I both know that the price we’ll be willing to accept for our shares must compensate us for all the time and risk we assumed. It’s all a matter of “when,” not “if,” and it comes down to your strategy of preparation. Resolve and patience have made resource tycoons rich – these are people who are cut from a fine cloth. The end of the year is always a good time to take a step back and put things into perspective. Take time to do that – you’ll be glad you did.